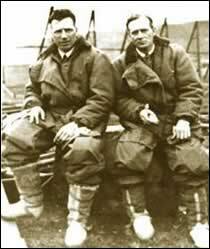 Alcock and Brown were the first people to fly an aircraft non-stop across the Atlantic ocean. They made their flight in June 1919, departing Newfoundland and landing in a bog near the Marconi (Clifden) Wireless Station. The plane was a Vickers Vimy twin-engined biplane. It was built mainly of wood and fabric and was powered by two Rolls-Royce Eagle VIII V-12 engines. The Vimy was originally designed as a bomber to be used during the First World War. Bombing equipment was removed and extra fuel tanks were added for the transatlantic flight. The Vickers Vimy biplane that landed at Ballyconneely, Clifden on 15th June,1919. The plane is now on display in the Science Museum, London. The plane took off from St. John's, Newfoundland on Saturday, 14 June, 1919 and landed in Clifden, Co. Galway some 16 hours later. It completed the journey of 1,890 miles (3,040 km) at an average speed of approximately 118 miles (193 kilometres) per hour. Weather conditions were difficult, dense fog and drizzling rain obscured vision to such an extent that at times the aircraft was flying upside down and once only 10ft from the water. The landing place was a bog near the Clifden Wireless Station. Once safely out of the plane, Alcock, with the assistance of the Marconi staff, sent a telegram announcing their success. At this point the airmen were only 10 miles (16 km) off the course they had planned and some 50 miles (80 km) from Galway, the intended destination. "From above, the bog looked like a lovely field, but the machine sank into it up to the axle and fell over on her nose" said Alcock after the flight. The plane suffered some damage. Alcock and Brown came away unhurt. Sir John W Alcock (18921919) was born in Manchester. He joined the Royal Naval Air Service at the beginning of World War I. After the war Alcock became a test pilot for Vickers Aircraft. Six months after his Atlantic crossing, while delivering an amphibian aircraft to Paris, Alcock crashed in bad weather and was fatally injured. Arthur Whitten Brown (18861948) was born in Glasgow. He began his career in engineering before the outbreak of World War I when he became a pilot in the Royal Air Force. After the Atlantic crossing, Brown later returned to engineering and was general manager of the Metropolitan Vickers Company in Swansea.